At the British Library on the 14th November 2018, we celebrated the conclusion of the “Queer Beyond London: Sexualities and Localities 1965-2010” project and discussed the importance of local LGBTQ history work with a panel of experts. 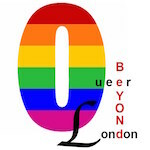 “Queer Beyond London”, conducted by Professors Alison Oram and Matt Cook and Dr Justin Bengry, has looked at Brighton, Manchester, Plymouth and Leeds and compared how their particular histories have made a difference to LGBTQ lives and experiences. How do local contexts – geographic, demographic, social, economic – shape LGBTQ lives, politics and community? When we stop seeing London as the centre of queer history, what new insights do we gain? How have local LGBTQ groups researched and publicised their particular histories and how might that work be best supported? At this event we discussed these questions and more with curator of the Museum of Transology, E-J Scott, pioneer historian of sexuality, Professor Jeffrey Weeks, and Rachel Hasted, advisor on LGBTQ inclusion in museums and heritage.